We are excited to introduce Kayla Michelle, whom you may recognise as the presenter of our recent Members "Inspired Lifestyle" Seminar, and regular program contributor on all things nutrition related. Kayla, an Accredited Practising Dietitian, is now based on site here at AquaPulse, offering her Dietitian and Nutrition Services by appointment from the Wellness Suite, which is located along the members entrance on the ground floor. Kayla is a good person to speak to, and when using her services, she will look to understand your current health and lifestyle patterns with a view to creating a customised nutritional program that is tailored to your current situation. “Coming to WynActive is great for me as a dietitian because a lot of the members are really looking to become fit and healthy, and wanting to make positive changes to their lifestyle, and these are the kind of people that I love to work with. So, I’m really just excited to meet with people who are focused on getting into an active lifestyle, and who are ready to learn more about the role that nutrition plays. I’ve always lived locally so getting to base myself here at AquaPulse is a great fit. Just about anyone can benefit from coming to see me, whether it’s for nutritional tips or reassurance to see if their current diet is giving them enough nutrients. I can assist people who want to lose weight or gain more muscle as well as older people who have changing dietary requirements. And then there are people who have medical conditions like diabetes, heart disease or food intolerances who could benefit from seeing a dietitian. 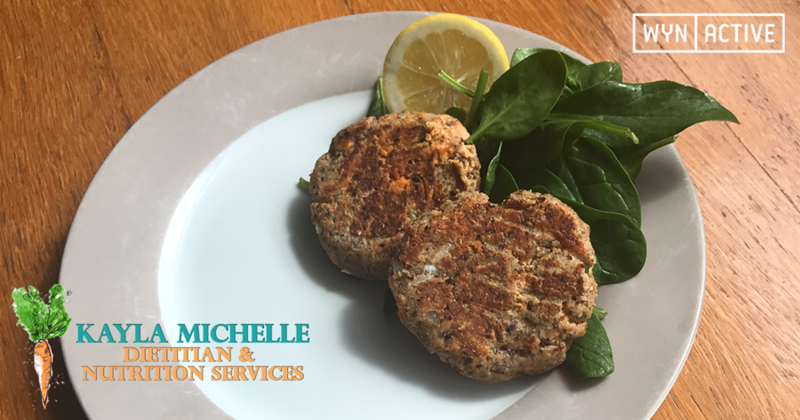 Kayla recently posted on the WYNACTIVE FACEBOOK PAGE the first of her simple and tasty, healthy recipes – Kayla’s Salmon Patties. Salmon is a great source of Omega-3 fatty acids – these are healthy fats which play an important role in brain health and have been shown to reduce memory loss. Step 1. Combine all ingredients in a bowl & shape into patties. Step 2. Heat drizzle of olive oil in a frying pan. When oil is hot, add patties and cook on both sides until golden brown. Makes 3-4 patties. Serve with a tasty salad and a squeeze of lemon. Enjoy! We look forward to bringing you many more of Kayla's delicious healthy recipes via social media, be sure to FOLLOW THE AQUAPULSE FACEBOOK PAGE to keep seeing Kayla's recipes.